KV 315. Composed by Wolfgang Amadeus Mozart (1756-1791). Arranged by Jos van de Braak. Full score. Duration 6:00. Published by Baton Music (BF.BM562-SCORE). The 'Andante in C for Flute and Orchestra', KV 315 was written by Wolfgang Amadeus Mozart in 1778 when he visited Mannheim and commissioned by a rich Dutch merchant and amateur flautist. According to a number of scholars, it is likely that this 'Andante' was written as a replacement for the 'Adagio ma non troppo' in the 'Flute Concerto in G Major' KV 313. But it is also speculated the 'Andante' may have been part of the third Flute concerto Mozart that he never completed. 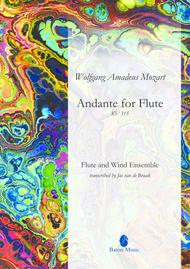 Nowadays the 'Andante' KV 315 has become a very popular piece in the literature for Flute.